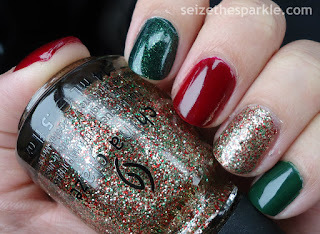 These skittles are just about as Christmasy as a manicure can get! And I know I say this every year, but this is my favorite set of Christmas Skittles yet. There's just something about the combination of the deep crimson red in Ravishing Dahling with the greens of Holly-Day and Glittering Garland. 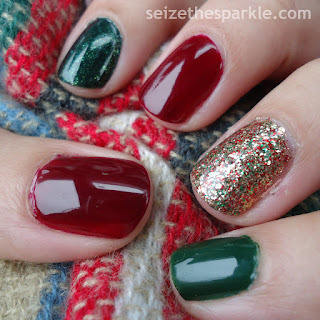 And then there's Twinkle Lights, one of my favorite Holiday glitter polishes ever. I missed out on Party Hearty, and yes... I'm still a little bit bitter. A little bit. On to the individual polishes. 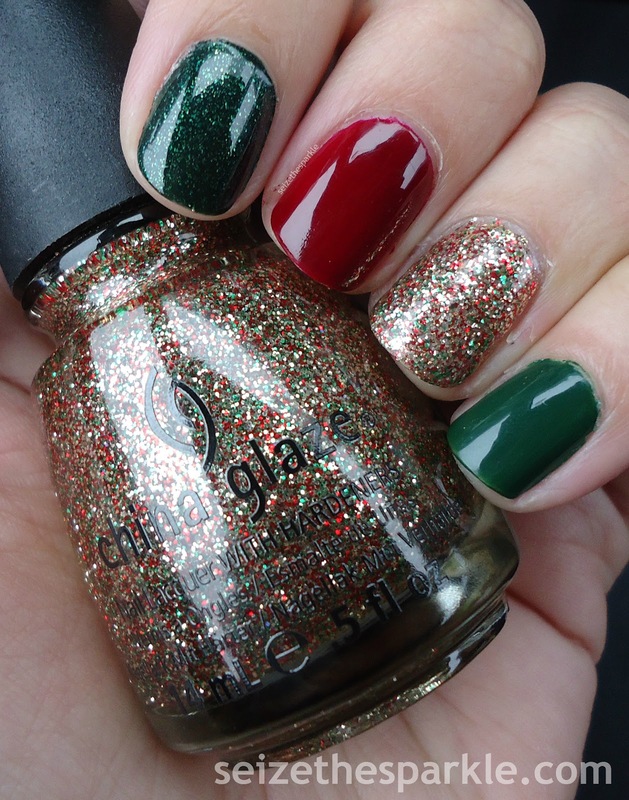 Gossip Girl is a glitter polish from Orly's latest collection Infamous. While you can't see it at all on my nails, it's a mix of small red hex glitter and large gold hex glitter. At first, I was going to blend it with Twinkle Lights, but instead, I used it as a base for Twinkle Lights. Don't worry, I'll be showcasing it soon enough, I just have to figure out exactly the best way to do that. Ravishing Dahling is part of China Glaze's core collection. I don't recall having issues with it before, but it was a little streaky. I thought I had everything evened out at five coats, but I still notice some splotches. Hard to say if one more coat would remedy that or not. But the shade of crimson? Swoooooon. I love this shade for the Holidays. Love. It. As far as the others, they were all part of the China Glaze Let It Snow Collection from 2011. It's a collection that holds a special place in my heart, because that was right around the time that I got really into nail polish and blogging. It was the first collection I went out searching for and bought six out of the twelve shades. A massive haul at the time. Glittering Garland is a gorgeous evergreen jelly bursting with lighter green shimmer. Holly-Day is a creme, slightly lighter shade of green. Twinkle Lights is a glitter topper that's overflowing with small green, red, and gold glitters. I almost hesitate to call it a topper because of all that glitter! All three polishes went on without issue. Twinkle Lights is a little thick because of all the glitter, but still very workable. Also worth pointing out, I didn't have to thin out any of these polishes, and I've had them since 2011. You know, thinking about those first days of nail polish hunting and starting my first blog really takes me back. So much has changed since four years ago. And not just colors or finishes, brands, blogging, the rise of indies... it's been a wild ride! I think the thing I miss the most is walking into a store and being completely blindsided by a collection that I hadn't read anything about. That rarely happens nowadays! And it makes me curious... what are some things you miss about your first days of nail polish hunting or blogging? Let me know in the comments!